When Plattco developed the in-line maintenance concept, we knew it wasn’t enough and wanted to bring even more value and savings to our customers. The seat and flapper of a Plattco double flap airlock valve were both designed to be reusable and restorable. Your airlock can be “like new” at a fraction of the cost of purchasing new components. The Regrind Program is yet another benefit of using Plattco Double Flap Airlock Valves. 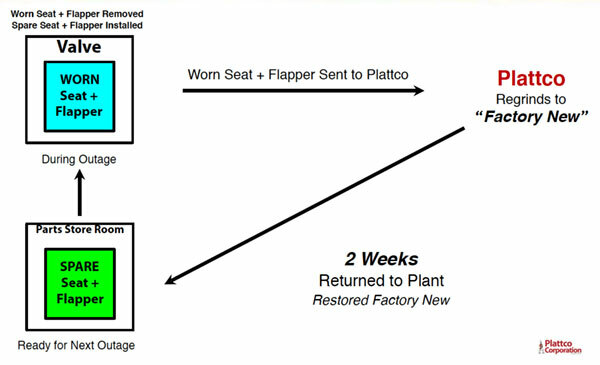 The two mating surfaces, the seat (which holds the material) and the flapper (the door that opens and closes) are air tight after they leave the Plattco factory. They are designed and manufactured with additional material and are machined to almost flat, with a tolerance of no more than three thousands flatness. The beauty is as these metal to metal surfaces begin to wear they can be removed from service, returned to Plattco and resurfaced as part of the Regrind Program. Using our state of the art wet-grinding process and blanchard, we are able to resurface these components to a “like-new” condition. The Plattco standard is that each of these components can be resurfaced (3) times - meaning you get (4) lives out of each component! The seats and flappers are cast and machined out of wear-resistant alloys, which can be reground to provide the same level of airtight, sealed performance as when they were originally installed. These components can be replaced quickly and easily without disassembling the valve or taking it out of line. After 3 million times of opening and closing each year, there will be wear that starts to occur. And once it starts, it only accelerates. Many think when they get wear on the valve they have to replace the seat and the flapper completely. But, a lot of money can be saved by using the Regrind Program, as re-surfaced/reground parts are supplied at about 15% of the cost of the new replacement component. It’s fast, inexpensive and the best way to maintain the airlock on your valve. Contact us to regrind your Plattco valves back to their original level of performance.